Miss Lucy's Boutique: A dress a week til Christmas! So I had an idea, and I'm hoping all of you will jump on the party train with me and take advantage of this one. Following in the footsteps of what seems to be the trend at the moment of so-many-things-in-so-many-days, I would like to start a little project of my own to try get some of you dressed up in some of my frocks and help me grow my collection. A dress a week til Christmas goes like this. 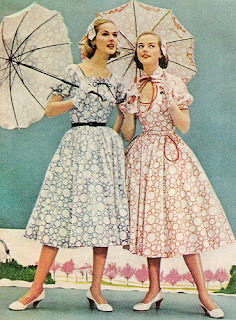 On a Saturday afternoon I will post on the blog a picture of some fabric and 3 sketches of fabulous frocks. You like what you see? First person to choose one of the sketches and email me can have the design made up in their size for only $45. That's right folks, your own personal Love Lucy creation for only $45! get excited! P.S: starting next week it's only 12 weeks til Christmas. That's only 12 custom dresses that will be going at this special price. Get in while you can!